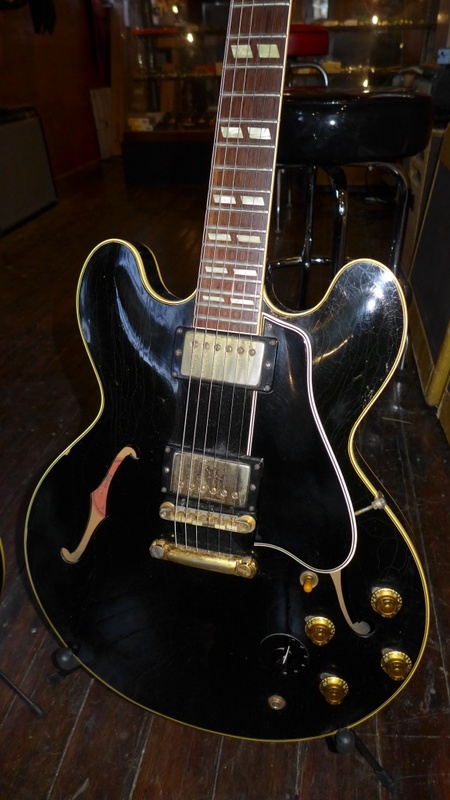 I am dead certain that this is the very first black ES-345 made and maybe even the first black ES thinline. It is a first rack (short leg PAF and huge neck) and was shipped in April of 1959. It is awesome. 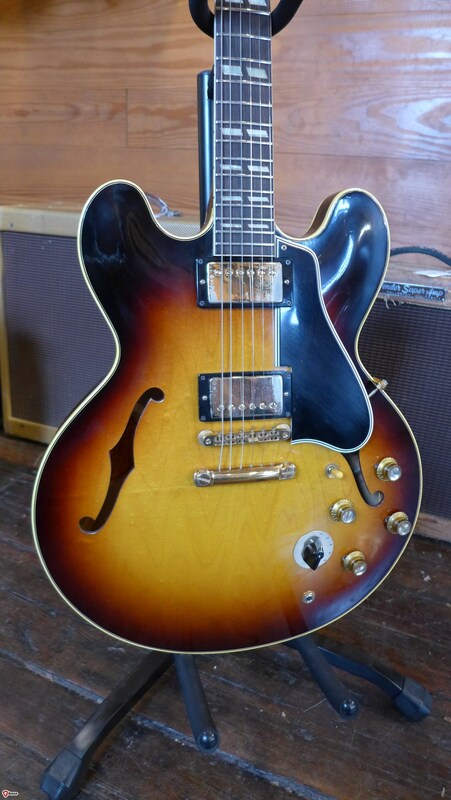 As I write this, I’m sitting (in coach) on a Delta flight to Las Vegas with the single mission of picking up a very rare and very expensive ES-345. It’s a first rack black stop tail and is almost certainly the first black 345 ever made and maybe the first black ES ever made. Let’s see, it took me 2 hours to get to the airport and another hour for security and boarding and another 5 hours and change to get to Las Vegas and who knows how long before I check into the hotel. Then make the deal with the seller-check out the guitar and do the whole trip in reverse. Ever wonder why dealers need to mark things up? Let’s see…36 hours out of my life, $500 for airfare, $70 worth of parking at JFK, $150 for a room and probably another $75 for food. So, why not just send the guy the money and have it shipped? What could possibly go wrong? (go wrong…go wrong…). Well, there are a few things to consider. 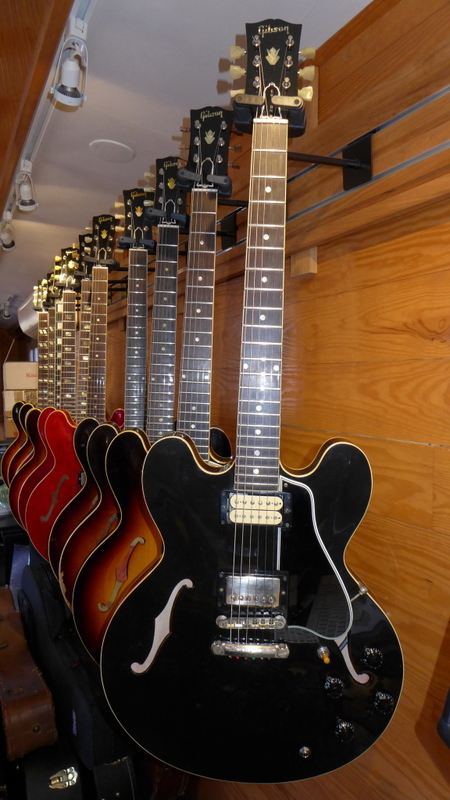 When buying from an individual seller, you can’t always count on the dealer amenities you expect from a reputable dealer-like an approval period, professional packing and a full disclosure of every part, ding, scratch and issue with the guitar. Sometimes it isn’t reasonable or fair to ask a seller to take out the pickups and look at the stickers. Sometimes the seller knows nothing about guitars and wouldn’t know a broken headstock from a broken toilet. 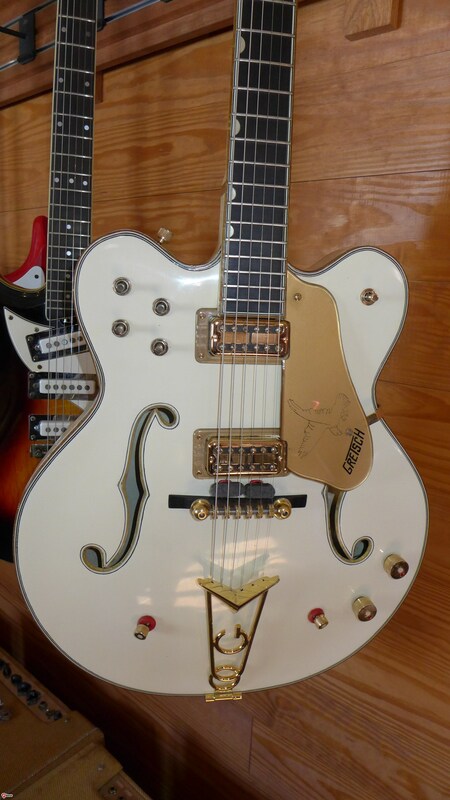 This seller happens to be fairly knowledgable but this is a very expensive guitar and whoever buys it will certainly expect me to have gone through it with the proverbial fine tooth comb. That’s why I’m on an airplane and not at home with my beautiful wife and lunatic dog. There’s another factor to consider as well. Black is a tricky color. It photographs terribly. The good news is that it usually looks better in person than it does in the photos. The bad news is that opaque colors are a good way to hide a break or a refinish. More good news. 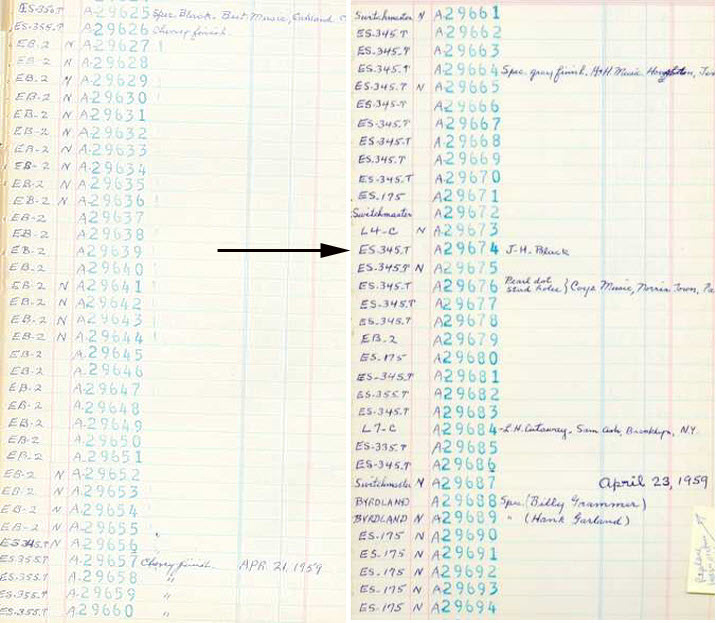 I have the shipping ledger page for this one and it indicates factory black. I’m pretty good at sniffing out a refinish but it almost impossible to do it from a photo, especially on a black guitar. My method requires having the guitar in hand (and no, it isn’t a black light, although it’s a good tool especially for revealing overspray). When you can’t assume the option to return a guitar if it isn’t as described, then a road (or plane) trip is almost mandatory at the high end of the market. I have had plenty of $30,000+ guitars shipped to me. One has gotten broken. A surprisingly high number have had undisclosed issues from repro switch tips to changed pots to non functioning truss rods to twisted necks. It is generally not malicious. Most folks simply don’t know how to tell a real catalin switch tip from a good repro. Even fewer folks know when a truss rod is no longer working. Fewer still can pull a harness to check the date codes (or even read the date codes). Scary? You betcha. I have to admit that being a vintage guitar dealer is fun and often rewarding but it can be pretty stressful on the buy side. So, maybe 12 hours in an airplane and 2 hours in airports and 4 hours in the car is worth it. Well, look at it this way, it’s worth it if I come home with the guitar. What happens if something is wrong and the seller won’t alter the agreed upon price? Then I go home empty handed about $800 poorer (assuming I stay away from the craps table) but maybe I don’t take a huge loss on a guitar that isn’t what it was cracked up to be. I expect this to turn out well though. I have a lot of photos and I have spoken to the seller many times (it took a very long time to make this happen-I knew about this guitar in 2014). He is a pro player and even played on a few hit records back in the 60’s. Still, this one wasn’t going to be shipped sight unseen. Too much stress and too much money at stake. I’ll post photos when I have it. Questioning the finish? Folks always do, so this ought to put your mind at ease. Not sure who J.H. is but he ordered a black guitar 57 years ago. 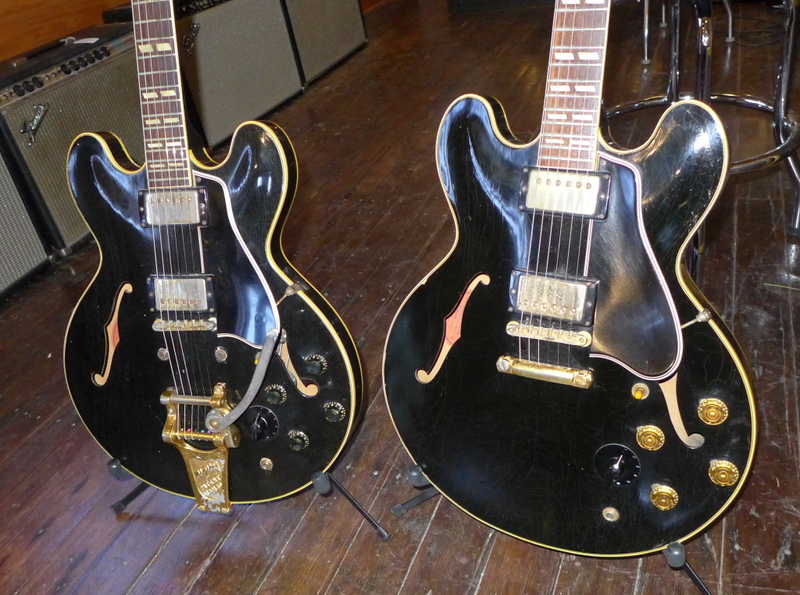 I believe there are only four black 59’s (the 60 with a 59 FON is still a 60). Here are two. They are from the same factory order 13 numbers apart. Nope. Not a reissue. Not a real dot neck either. It’s a Ken McKay “tribute” 335 that took me and my friends more than four years to complete. I think it was 2011 that I was contacted by Ken McKay to help him out with some measurements for his new 59 ES-335 “tribute” bodies. Ken was going to make the bodies an exact copy of a 59 ES-335 and you were on your own when it came to putting a neck on it and fitting it out. I was very impressed with Ken’s work and wrote a blog post about him. Find it here. I bought one of Ken’s creations to see how it checked out against the real thing. Then things started going awry. My friend Chris made a neck for me using a nice piece of Brazilian rosewood for the fingerboard I had been saving since the 90’s. I had the dot markers made from a set of vintage inlays and had him custom carve a rather 64ish neck profile. It was a true custom as I was there when he shaped it so I could say take a little more off here and leave it fat here. I did it by feel-not by the numbers. I could have asked for .88″ at the first fret and .98″ at the 12th like my 58 but I chose to go by feel alone. It turned out to be around .855″ at the first and .96″ at the 12th. A little shoulder but not much and a neck set angle somewhere between the really shallow 58 and the more moderate 60. Medium jumbo frets finished slightly lower and flatter than normal and I had a true custom neck. That part was delayed by various circumstances affecting my life and Chris’s so it took some time. I think we had a completed body and neck by around 2013. Then came the finishing. I wanted the guitar to be watermelon red and I asked my regular luthier, Dan, to paint it. I was very specific about the red I wanted and we just couldn’t get it right. We got a nice red but it wasn’t the right red. So, I told him to just paint it black. Dan got very busy with his own line of guitars and I got very busy moving from Westport, CT, closing my NYC video business and opening my shop in Kent, CT. I kind of forgot about the McKay 335 and so did Dan. We both had too many other things to do. But, finally, the McKay was painted and ready to put together. I thought about assembling the guitar using only vintage parts but I didn’t have everything I needed, so I improvised. The tuners are no lines from a 52 Les Paul, the bridge is a 59 no wire ABR-1, the stop tail is a repurposed wrap tail from a LP Special. The neck pickup was a Shaw PAF that Dan rewound for me using the purple enamel wire of a PAF and a pair of white bobbins that I left uncovered for the neck. The bridge pickup is a real 59 PAF that I left covered. The harness is from RS, the knobs and guard are repro. The TRC is a real “Custom” from the early 60’s and the strap buttons are the real deal plastic ones from 59 or 60. So, it should sound like a real 59, right? Well, the wood isn’t exactly old and the lacquer is still curing but I strung it up with a set of 11’s and sat down to play. First impression was more than just OK. The bridge pickup is awesome. Bright, articulate and complex. The neck pickup is a monster. Loud, prone to distortion (it’s slightly overwound per my specs-I love a neck pickup that approaches 9K) and did I say loud? The middle position was out of phase which is pretty interesting but I’ll probably flip the magnet in the neck pickup and see if I like it better in phase. I’m supposed to check the phase before I install the pickups and string up the guitar. I didn’t. But beyond the great tone of this guitar was the surprising playability. Having a custom made neck is a real luxury. Having the frets done to my spec is also a luxury. And a piece of very tightly grained dark, dark Brazilian rosewood completes the package. So, it took me more than four years to get this guitar done but it really compares favorably with the best of the dot necks I’ve had. The shallow(ish) neck angle and perfect intonation make for a very playable and comfortable guitar. Vintage electronics and a custom wound neck pickup make it sound like I want a 335 to sound like. And look at it. It looks authentic. Ken got the shape dead on which Gibson still can’t do. I didn’t have it relic’d so I can crap it up myself. Most of you know, I never keep guitars-even my favorites end up for sale and this one will probably go as well. Somebody is going to get a work of art. Thanks Ken.